Summit has worked in the following communities to improve their disposal of solid waste. 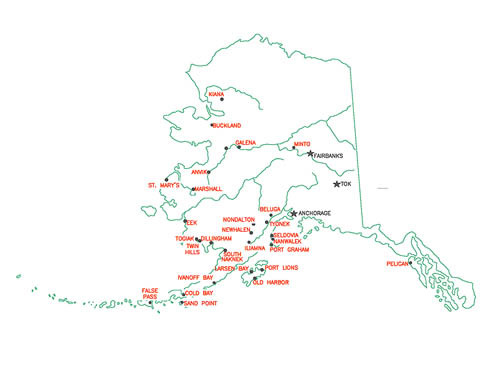 Solid waste management is difficult in many Alaskan communities. Dump sites often fail to contain the waste, they attract wildlife and disease vectors, and threaten the health and safety of local residents and the environment. Trash at these dump sites is often burned on the ground or in crude burn containers in an attempt to reduce volume and solve these problems. Unfortunately, the problems often persist. Summit Consulting Services, Inc. has developed a unique product line of solid waste equipment that is designed to mitigate these concerns and provide better management of solid waste for rural Alaskans. United States Department of Agriculture, Research and Development (USDA RD) Solid Waste Construction Grants. For a current list of funding agencies contact Dave Lancaster in Summit's Anchorage office at (907) 563-5675.